Ultrasabers is extremely excited to present the Menace. 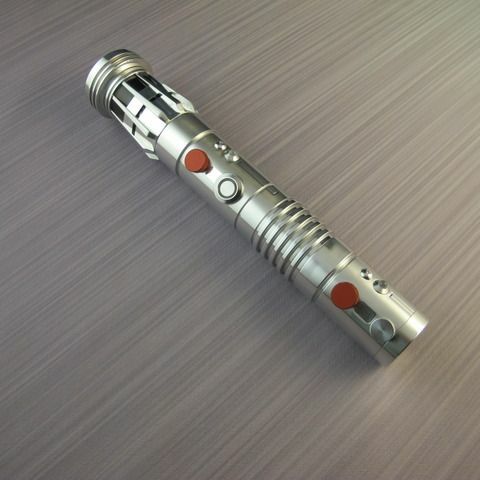 The new Menace brings one of the most coveted and loved saber designs to the Ultrasabers lineup. The Menace is of course fully made of T6 Aircraft Aluminum and combat ready. The Menace is available in 5 different finishes: High Polish (SE), Black Anodize (Dark), Red Anodize (Crimson), Blue Anodize (Azure), and Nickel Plated Finish (CE). 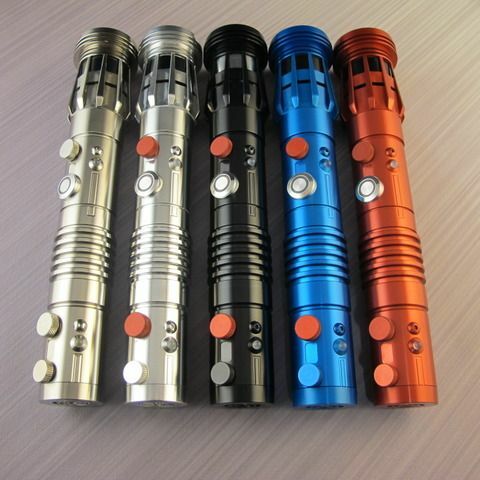 The emitter is also available in 4 different styles. You can get the emitter underlay in Silver or Black and also with or without Windows. 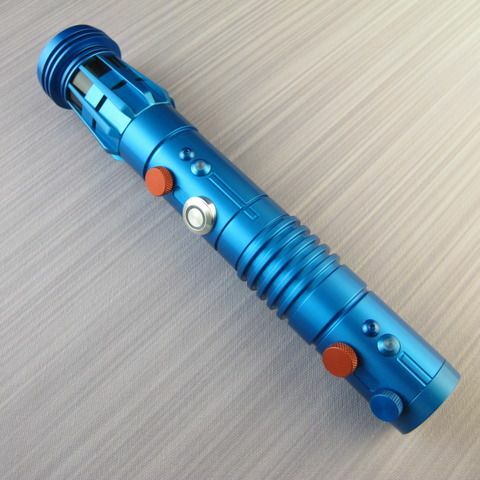 In addition to that you can also stylize your Menace by selecting the color of all 3 Knurled Screws on the hilt. 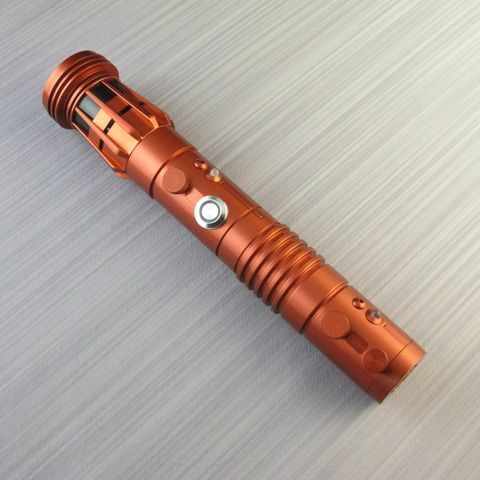 The Menace is able to accommodate sound installs, Emerald LED driver installs, and has a MHS compatible emitter & pommel as well. The Menace comes standard with a Black Covertec wheel. The Menace comes standard with a 36" blade, is 1.5" wide at the grip, and 10.375" long from the top of the emitter to the bottom of the pommel (11.250" long with Recharge Port installs or Emerald Driver installs). 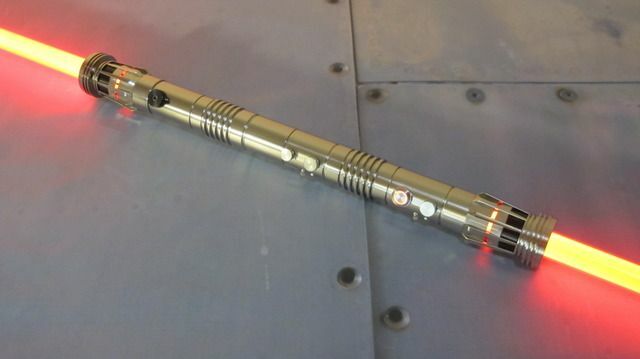 The saber comes completely assembled and ready to go. 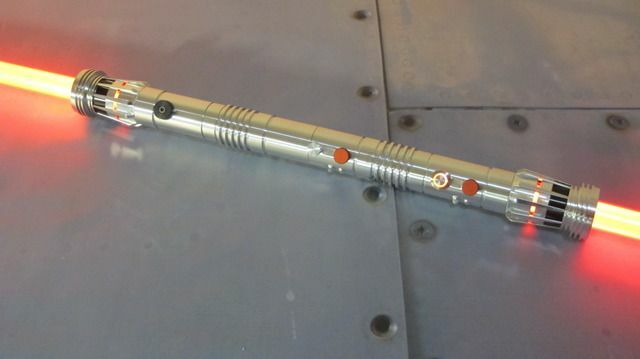 The pommel and emitter are removable and compatible with TCSS MHS parts. Sound and the Emerald LED driver are also available options. Both Standard Setup and Li-Ion Setup work perfectly for a Menace with No Sound. However, Li-Ion Setup is mandatory in order to add sound or the Emerald driver to the Menace. I know I am not the only one who has been waiting for this to come out. The CE is by far the most beautiful of the bunch. 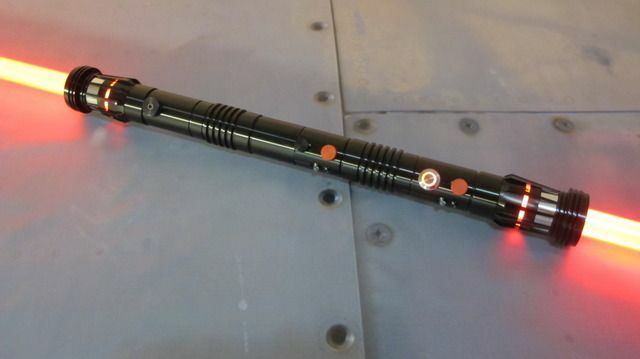 I think it most closely resembles Maul's saber in TPM. I hope to hear others opinions on this as well. Thanks Deep for making this happen. 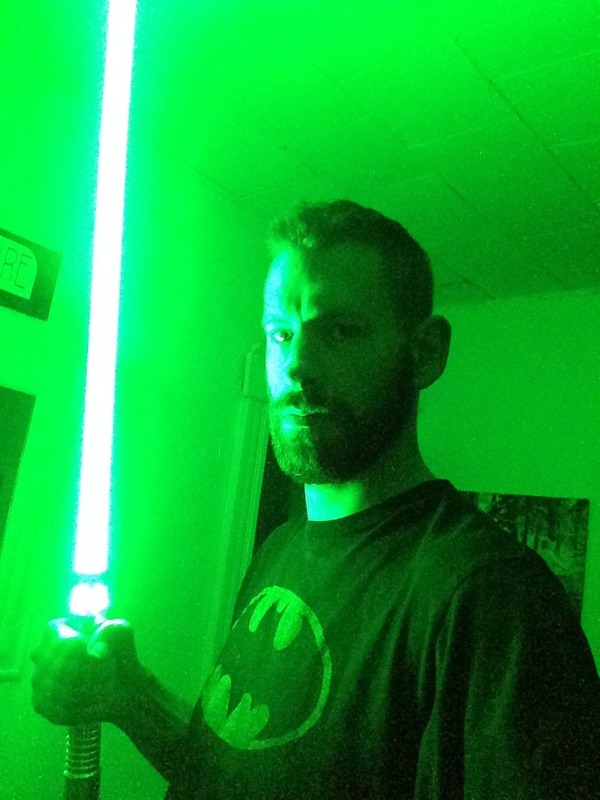 Y'all are the best, please keep up the awesome work that y'all are doing, and we will keep supporting UltraSabers. Own: Lost Gray, Obsidian V4, Tri-C AS; Fulcrum, Obsidian V4, Tri-C AS; Nickel-plated Guardian, (Emerald), Obsidian V3; Arbiter, Obsidian V3, GB; Archon V3 Tri-C FO Obsidian V4; Manticore, Obsidian V3, VA; Phantasm V4, BH; Dark Sentinel, BR; Dominix V2, RGB; Dark Initiate V2 x3 (BR, CG, GB); Initiate LE V2 x2, CG. I would get a Crimson with yellow blade and an Azure with green blade for a fabulously colorful staff. Yes, I'm prepared to be the court jester as it would just be too much fun. And I have several "serious" staffs already. Well done Ultra Sabers! I like this idea Dauntless, Im still working on my serious sabers. I don't think I can go so colorful just yet, but I would love to see it when/if you ever put it together. 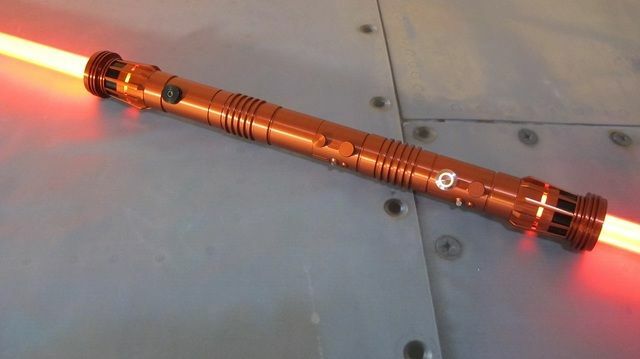 This is a truly amazing saber! Now I can't decide whether to get this or the Flamberge next! Concerning the silver ones the shinier one is high polish and the darker one is nickel plated right? Might have to add something else to wishlist. 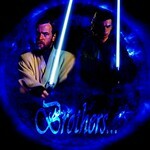 I felt a great disturbance in the force as if millions of nerds cried out in terror and were suddenly silenced. Integrity can accommodate the inadvertent error and the honest difference of opinion; it cannot accommodate deceit or subordination of principle. Might have to get this next raffle. Not sure how that covertec placement will affect my grip though. Maybe it's a stupid question, but are 'proper' (colored) Menace couplers available in the shop yet? Cake is a lie. There are only Cookies. Through Cookies I gain Chocolate. Through Chocolate I gain Energy. Through Energy I gain Weight. Through Weight my pants will burst. 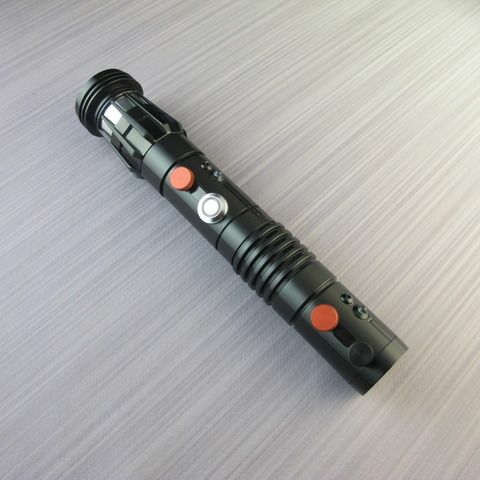 A Menace CE with a red blade and black emitter... Yeah. If I can scrape the cash together for the raffle this time, that'll be my entry. Quick disconnects, too! Menace in silver, Menace in pink, Menace in green... *drool* When's payday, again? I have been dreaming and hoping and now not just mine but OUR prayers have been answered!!!!! And it feels so phenomenal!!! I will get every finish that the Mence is available in!! 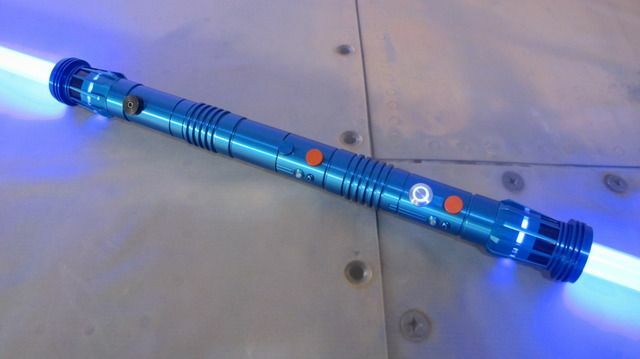 I'm just freaking out that this saber is finally here!! Emory and ultra sabers are truly the best of the best and always know how to excited!! I'm getting all the Mence!! SO HYPE RIGHT NOW!!!! 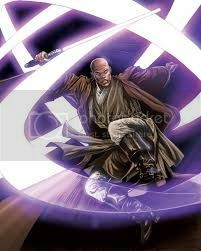 Why be enslaved to Light or Dark side. When I can rule both!! Wow! This is awesome. 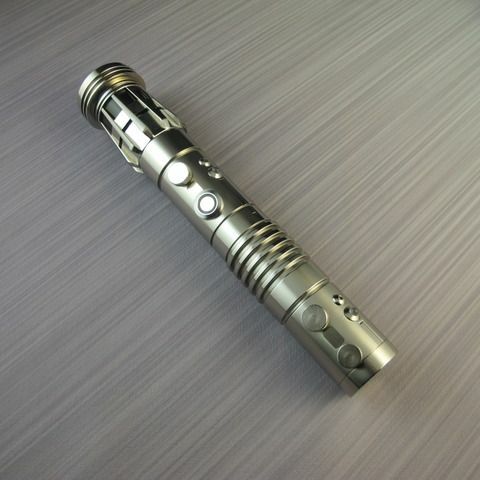 I'm not a double edge saber guy but this will definitely be an awesome collector's item. Great Job Deep!